Wood Pellet Grill Smoker Book Available Now! FINALLY it’s out in the wild! I love the way my wood pellet grill smoker cookbook turned out! 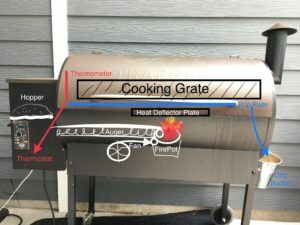 I had been talking with a lot of readers about what kind of BBQ they want to learn about and I was surprised to get a few suggestions for EASY smoker recipes for goodies like ribs, beef jerky, and specifically wood pellet grill smoker recipes. It all clicked. I LOVE using my wood pellet grill. 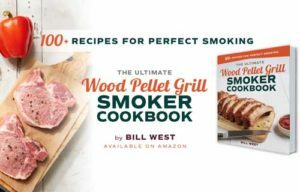 “The Ultimate Wood Pellet Grill Smoker Cookbook” is available for order now HERE on Amazon! I get to use live fire and wood with safe set and forget ease. I’ve done a few videos with the pellet grill and have loved testing all the recipes. My buddies in competition BBQ win big contests with wood pellet grills. They are compliant with rules. So, I worked hard to break down and write down all the “essentials” about Pellet Power BBQ. Then, my wife, MJ and I had a blast putting these recipes together and getting them just right. We can’t wait to share the SMO Fried Chicken recipe in the book. It is now one of our all time favorite recipes. Keep checking my socials (and here) and I’ll continue to share recipes, tips, sneak peeks, and more. I love the convenience of a simple electric smoker. In my book The Complete Electric Smoker Cookbook I spent considerable time to get the Electric Smokers Compared. Here’s the Bradley vs Masterbuilt vs Charbroil lowdown. When you compare Bradley vs Masterbuilt (or even Bradley vs Charbroil) you’ll need to know that Bradley’s wood “pucks” (or bisquettes as they call them) are proprietary. Masterbuilt vs Charbroil are very similar using wood chips. However the chip “containers” differ. I like that Masterbuilt can be “side loaded” (see below). Charbroil has great build quality. I’ve been using mine happily since I shared this Electric Smoker Unboxing video here. I really like having both a window and stainless steel on this model. Here’s an adapted excerpt from the book with a few video examples to help you decide on a brand you may prefer. First, Electric smokers are beloved for simplicity. That’s why I originally fell in love with my first simple Brinkmann Gourmet electric smoker. The Brinkmann Smoker was the first thing that got me into the smoking game. Here are the top benefits of electric smokers when it comes to preparing foods safely and reliably. First of all the temperature is easily controlled and dependable. Like your home oven, your smoker’s electric heating element is built to hold a solid steady temperature. The heat is reliable. It won’t “go out” accidentally. It has a cleaner operation with no need to exchange a lot of charcoal or fuel. Stainless steel interior allows for a more sterile environment. Finally, sealed cook chambers and modern construction are better for keeping out the elements than standard smokers. Bradley, Char-Broil, and Masterbuilt are the “Three Musketeers” of electric smoking. All electric smoker models have very similar, and in some cases almost identical, features. 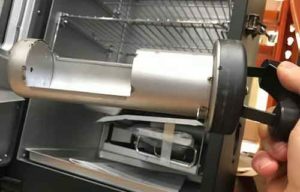 Some may have a few important and potentially limiting specialty features (such as for cold smoking or high temperature), but when it comes to electric smokers compared side by side there are a few hallmarks of each brand. Bradley smokers can be spotted from a mile away due to the Bradley Bisquette feeding system. Bisquettes are proprietary to Bradley and therefore keep you locked into the Bradley brand. The mechanical Bisquette feeder is great for cooks who want quantifiable control of wood and smoke flavor. Woodchips come in tons of flaviors and, likewise, Bisquettes are available in 14 “flavors,” including the most common smoking woods and some more exotic woods. The Bradley family of smokers comes in original, digital, and smart versions. Digital versions allow you to dial in an exact temperature while smart smokers allow for remote control from your smartphone. Char-Broil has been around since 1948. Charbroil is known for affordability, solid value, quality, and great design. The newer deluxe models include some hi-tech extras such as wireless control and internal thermometers. There is also a tight latch to clasp the door securely. There’s something about a chunky latch that makes my inner caveman happy. 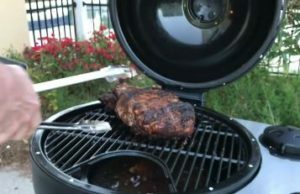 Char-Broil also offers variants such as the Simple Smoker. It’s the perfect size for smoking that once-a-year Thanksgiving turkey. 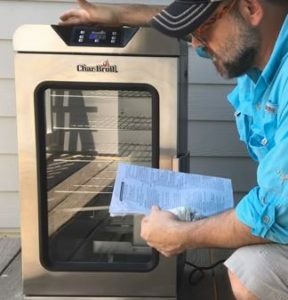 Additionally, if you’re looking to get into the world of wireless control and Bluetooth connectivity with your smartphone, Char-Broil has great options in its digital line. The company has recently stepped up the technology across all their cookers with the SmartChef series. Great for the gadget gurus. Masterbuilt boasts a mini-fridge design with a desirable wood chip–loading feature, therefore letting you restock the wood chips without opening the chamber doors, and thus not losing any heat. It’s the killer feature. 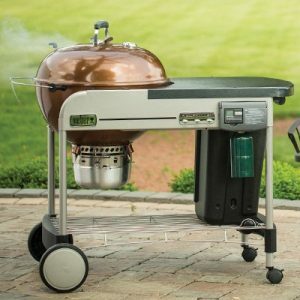 Plus, Masterbuilt has a tradition of catering to hunters with the electric (and non-electric) Sportsman line of smokers. 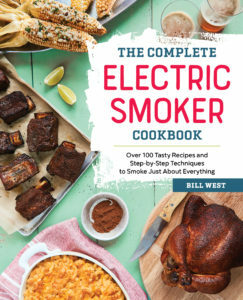 Other available brands include the primitive bullet electric smoker similar to the one I started with from Brinkmann, plus smokers from Smoke Hollow, Cookshack, and many more that will work with the information and recipes in this book. Finally, you may note that I haven’t mentioned REC TEC and Traeger, both of which are pellet cookers. Smoker recipes and information in The Complete Electric Smoker cookbook can all work with pellet cookers but haven’t been highlighted here because pellet cookers generally cook with heat generated from burning wood pellets and not an electric heating element. I am a big fan of pellet power. However, they are not officially electric smokers compared to the above names. However they do use electricity to ignite the pellets and to power an auger and fan that stokes the intensity of the burning pellets in a small fire pot. Cook Space 520 sq in. 780 sq in. (130 additional with optional racks) 504 sq in. 721 sq in. 721 sq in. 925 sq in. 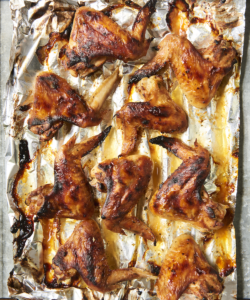 The above is from The Complete Electric Smoker Cookbook. Char-Broil has released the Kamander Charcoal grill and it looks to be a big green egg killer. It’s a double walled steel insulated “kamado style” charcoal grill that crushed the price of it’s green counterpart. The cost at amazon is around $350 but assembly is definitely required with the Kamander Charcoal Grill. Construction was easy. But recommended for two people. It took about 90 minutes with just me. I think you cant beat the price of the Kamander Charcoal grill compared to the ceramic cookers that seem so heavy and – perhaps – fragile with ceramic construction. Take a look at the accompanying video and I time lapse unboxing and initial firing. I was also impressed at how well the Kamander Charcoal Grill held a stable low 250 degrees. Plus even at high temperatures (I got it over 700 degrees f ) the steel exterior remained relatively cool to the touch. If you hate the thought of piecing together a grill like this I did discover Amazon has a service offering expert assembly for under $60. The materials are solid. The wheels on the Kamander are a nice, heavy, solid rubber. The latch and front handle are also “heavy-duty” and chunky. Nice seal on the rim too. Still, the weight of the whole grill is said to be 115 lbs and easier to handle than i imagined for double walled steel. We liked the sturdy stainless steel shelf and the stand are are included in the model. 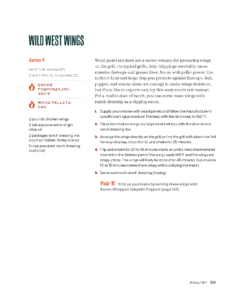 With the Big Green egg a lot of the extras – like a drip pan – are additional purchases. A quick search of prices for Big green Egg vs others shows that the price for most Big Green eggs were close to a thousand bucks except a tiny version that was priced at approximately $650. Other brands like Kamado Joe are a bit lower priced vs Big green egg. Weber have been making grills for a long time, but they’re not regarded as an old-fashioned company, because everything they do is so innovative. As the market for grills continues to grow, they keep responding with new pioneering designs to keep buyers interested. One of these designs was a bowl shaped cooking area which is now well-known and easily recognizable worldwide. Another huge Weber success was perfecting the art of grill grate manufacture, and both of these are present on the Weber Performer Deluxe 22-Inch Charcoal Grill, which has become Weber’s standout product. We’re going to discuss it here; taking a tour through all the features and identifying some potential flaws. Ultimately after reading this review, you’ll have an idea about whether a purchase would be right for you. The Performer Deluxe weighs 99 pounds, but they’ve installed great wheels, so you’ll be able to roll it out into the back garden with very little effort. The measurements are 41.2 inches in length by 28.5 inches of width and the height is 50.2 inches, so it’s a pretty big unit, that offers lots of space for all your cooking needs, but if you want to transport it you’ll have to take the Performer apart and re-assemble. Fortunately the assembly is doable in 15 minutes, following the instructions in the manual, so you’ll be able to take it with you for camping trips and tailgating parties. If you recognize the bowl, that’s because it’s the same design Weber used on the Original Kettle Grill, with the difference here being the inclusion of the wheeled cart with extra space for food preparation. The shopping cart style design could have been a little more pleasing to look at, but it would be harsh to labor this point, because this is one absolutely incredible grill, for reasons I’ll explain in the performance section. I mentioned the bowl was the same as on the Original Kettle, and while this is true, when it comes to design and how it looks; there’s more to it than that. In gas grilling, BTU output and grates determine a products success, whereas in charcoal grilling, grates are all-important. Grates retain heat, and disperse it outwardly, enabling food to cook, and the speed at which they do this, along with how evenly they hold heat inside, is the difference between greatness, and an average taste. Weber did something magical here with the grates; they’re the perfect thickness, are made of solid cast-iron, and cook food in a way Weber have tried to re-create on other grills like the Original Kettle, but never quite succeeded. These grills are very good, and with the Performer, you get magical moist flavor-filled end results that have no parallels. When you pair these grates, with the added benefit of the bowl system enabling you to cook whole chickens and turkeys, as well as stake and ribs, you get outrageously good value. Have you ever started cooking, and you got called inside almost immediately, only to run back out fearing your food might be burnt? Have you ever been grilling, and felt like you’d rather be watching TV until the food is done? Usually, you’d be risking an imperfect dinner, but Weber have helpfully included a detachable timer, so you can take it with you wherever you go, and always be in full control of your barbecue. This is classic Weber, to have an idea of what specific things would make grilling easier for customers, and adding them on. In this same vain, the ash-catcher on the Performer Deluxe, will also please customers. Isn’t it annoying to see ash flying around as you cook? Well, the Performers ash-catcher is enclosed so none escapes, and ash will stick to its surface at the bottom. When you want to clean it out, the ash will simply fall into a garbage bag. The whole grill is just as easy to clean, with Weber’s porcelain-enamel coating, so one wipe will completely clean the grill, ready for its next use. This way you can enjoy your 363 square inches of space, rather than worry about how long it’s going to take to scrape all the debris off it. The only thing I’d say against the Performer is that they tried to sweeten the deal by including a lid thermometer, but it doesn’t work very well and isn’t all that accurate. Fortunately though, the Performer does heat up quickly and reaches temperatures of over 470 degrees; just don’t rely on the thermometer to tell you that. These are the best grates in existence, outside of commercial grills used at restaurants. Weber have also provided 363 square inches of space, an easy to clean surface, detachable timer, a great ash-catcher, and extra space to prepare food. This is a phenomenal grill, and that’s why it’s so popular, even though it does have an unreliable thermometer. The Verdict: A supreme new high in grill manufacture.